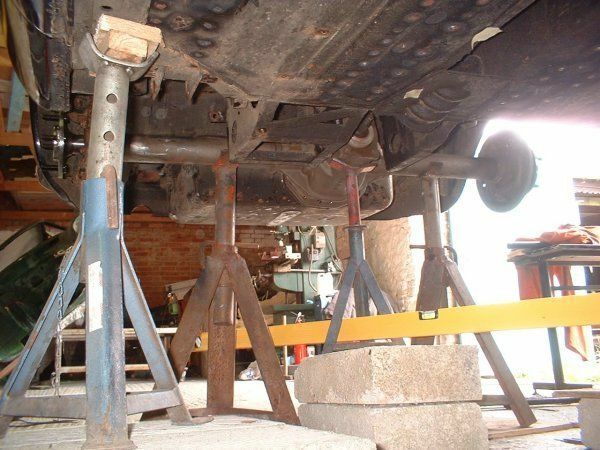 Setting a car up to be completely level makes life a lot easier when making measurements - it allows heights to be measured off a spirit level positioned underneath the car. The whole car was supported at about 3 feet off the ground. This still wasn't high enough to make working underneath comfortable. At the start of the project before taking the car apart, I put some masking tape over the wing finishers and marked the distance between these and the wheel hubs. On my car the distance between the centre of the wing finisher and the centre of the wheel hub was 370mm at the rear and 380mm at the front. My car may have been sitting a bit low at the rear due to old springs, so maybe 380mm all round would be the standard chrome bumper ride height (I'm guessing that the chrome strip should be parallel with the ground). 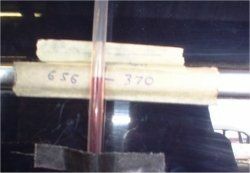 I checked the level of the marks I had made on the chrome strips using a plastic tube filled with red wine as a spirit level. 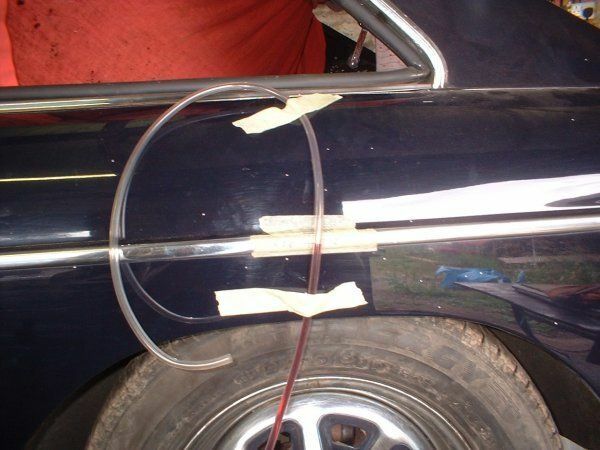 The other end of the pipe is at the front of the car. The height of each corner was adjusted until the marks were all at the same level. Red wine works much better than water - red wine is more visible and more accurate as it has less capillary action. The shortened axle was supported underneath the car using axle stands, and the hubs set to the correct distance below the wheelarches for normal ride height. The fore-aft position of the axle was set by mounting the wheels onto the axle and adjusting the axle position until the tyre was centered in the wheelarch. After the axle was set up, a blob of weld on the axle stands made sure it didn't move out of position. 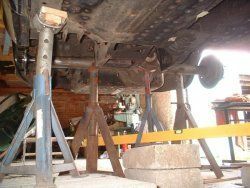 This is the axle set up below the car on a forest of axle stands. The angle of the differential was set up to give sensible propshaft angles. The angle across the joint near the gearbox was set at 1 degree, and the angle at the rear set at 1.5 degrees. With the body set level I could use a spirit level to reference mounting point heights. There are very few reference points under the car so a spirit level is essential. There are various points to take into account when setting up propshaft angles. If universal joints are used then the running angle during cruising should be between 1 degree and 1.5 degrees. The angle of a universal joint should never be less than 0.25 degrees under zero torque, or else you will have driveline vibration, however it can be 0 degrees for brief periods under full torque. Don't forget that the rear suspension settles under acceleration and the axle will tend to pitch.